Y’all have heard that quote about boys versus men and the cost of their toys. Most men get excited over new televisions, stereo systems, motorcycles, boats, and while I love all those things, I also get really excited about new laundry equipment. 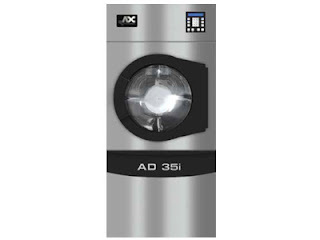 It’s true, and American Dryer Corp.’s (ADC) new I-Series Dryers are sweet. What’s new about the I-Series Dryers? They are calling them the I-Series, ‘I’ standing for intelligent airflow design; ADC continues to fine tune and make improvements with each model they introduce, and with this series, they’re boasting shorter drying times and safer, more reliable operations. ADC has also developed and patented an Automatic Airflow Compensator, which can be added to the I-Series. This automatically adjusts and compensates for the high static pressure caused by airflow restriction. This compensator senses, calculates, and maintains proper airflow through the drying process, resulting in faster dryer times, lower energy costs, and more efficient use of personnel time. ADC’s Sensor Activated Fire Extinguishing System (S.A.F.E.) completely removes any concerns about dryer fires because it instantly senses fire, quickly delivers water to that area, and then shuts itself down whether it occurs when in use or sitting idle. American Dryer Corp. has always been known for high performance and outstanding reliability. This new series delivers all of that with a sleek-looking design, stainless steel basket and front, and self-cleaning lint screen. It comes in both gas and electric for any facility connection. If you are in the market for a new commercial dryer, give Tri-State a call at 866-885-5218. We are happy to answer any questions you might have and to get you started in the right direction. Wascator Washing Machine. Standard reference washing machine. Wascator FOM 71 CLS Lab Washer-Extractor complies with M&S P1, IEC 456, ISO 5077/6330, etc.